Gregory was born to a wealthy family and trained in law and rhetoric in his youth. 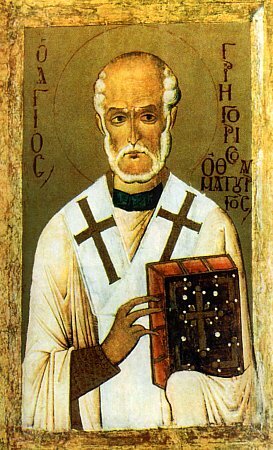 He and his brother each gave up the idea of law school, became students of Origen, and converted to Christianity; Theodore changed his name to Gregory. He studied philosophy and theology for seven years under Origen. He became Bishop of Caesarea, a diocese with only 17 Christians when he arrived. Gregory converted most of his bishopric; tradition says there were only 17 pagans left at the time of his death. Instituted the celebration of martyrs, teachings about the saints, and celebration of saint feast days as a way to interest pagans in the Church. During the Decian persecutions he and his flock fled into the desert. He worked among the sick when the plague struck soon after, and with refugees during the invasion by the Goths. He used his legal training to help his parishioners and settle disputes between them without taking their problems to the civil courts. He oversaw the council that chose St Alexander the Charcoal Burner as the first bishop of Comana. Macrina the Elder heard Gregory preach many times in her youth and passed his wisdom onto her grandsons St Basil the Great and St Gregory of Nyssa. Noted theological writer. As you might expect from some one surnamed the Wonder Worker, there were many miraculous events in Gregory's life. Gregory was patron against earthquakes and against floods and patron for desperate causes, forgotten causes, impossible causes and lost causes.